The aftermath of an unexpected type of crash. 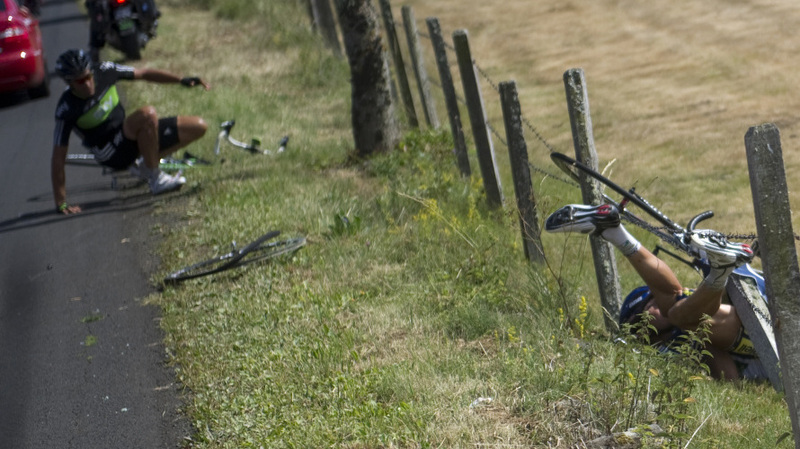 Crashes are commonplace and largely expected in competitive cycling, but not crashes like this one! The car and its driver have been removed from the remainder of the Tour, and rightfully so! Stage Nine was definitely another day of carnage, the worst of the year yet in fact, wiping out eight riders in one day! The Tour’s total number of riders has now dropped from 198 to 180. All 180 of them certainly deserve today’s day of rest, after nine days of hard and crash-filled racing and before tomorrow’s 98-mile stage 10. Unfortunately for Norwegian Thor Hushovd, he lost the yellow jersey yesterday to French favorite Thomas Voeckler. Thor Hushovd loses the yellow jersey after stage nine. In the spirit of Le Tour, I’m heading out now for my 10th consecutive ride day. No day of rest pour moi!